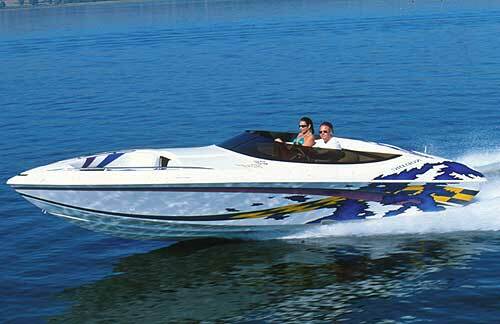 Nordic 26' Rush: Custom high-performance deck boat delivers crisp performance. Thanks to their wide stance and efficiency advantages, catamaran hulls have become the standard platform for most of today's high-performance deck boats. 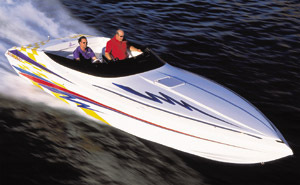 But that doesn't mean you can't find a sizzling deck boat in V-bottom form. 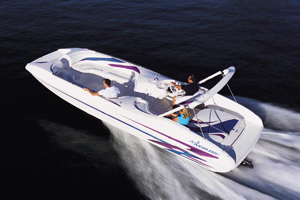 On the contrary, Nordic has offered one—the 26' Rush—since 1997. After testing the 22-degree deep-V model on the Colorado River in Parker, Ariz., we can see why the builder keeps it in its line. 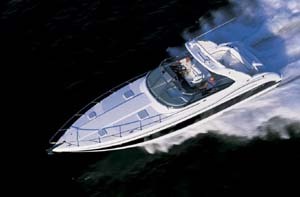 Unlike most catamaran-based deck boats, the 26' Rush leans into turns and carves in traditional V-bottom fashion. 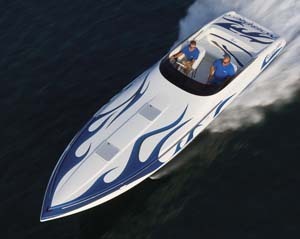 For those who don't care for the handling of cats but still want a hot-rod deck boat, it's nice to have an alternative. Nordic outfitted the 26' Rush with a Mercury Racing HP500EFI engine tweaked by Arizona Speed and Marine to make approximately 550 hp. 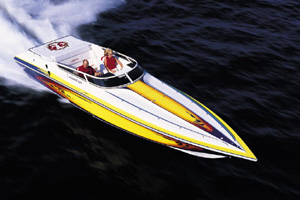 (A stock HP500EFI motor is factory-rated at 470 hp at the prop shaft.) 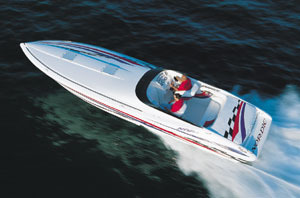 With a Mercury Bravo One 15 1/4" x 26" four-blade stainless-steel propeller on its 1.5:1 reduction Bravo XZ drive, the 26-footer topped out at 70.5 mph. The hopped-up propulsion package also came on strong during standing-start and midrange acceleration tests. Time to plane for the 26' Rush with its Bennett trim tabs down was 5.1 seconds, and in 20 seconds the boat reached 63 mph. Watching the 26' Rush from the docks during early morning photo runs, more than one member of our Test Team noticed how high the four-full-strake, delta-pad hull appeared to rise out of the water. That made us wonder if the boat would produce a pendulum effect entering and exiting corners. Far from it—the 26-footer carved nicely through all turns at a reasonable angle. 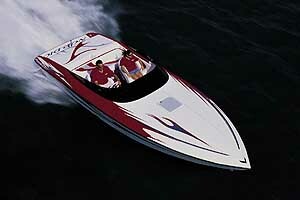 The boat was most agile at the higher speeds and was a pleasure to drive through slalom and circle turns. Tracking was excellent at all speeds. Also in contrast to its high-riding attitude, the 26' Rush crossed wakes and cut through river chop without a bobble. Nordic constructed the 26' Rush with four full-length stringers in the hull and a completely molded inner liner for the deck. Construction materials included Coremat, woven fiberglass and vinylester resin. All color was handled in the gelcoat and the boat's exterior was protected by a plastic rubrail with a vinyl insert. Though the boat wasn't overloaded with hardware, it did have all the requisite pieces, including four billet cleats, numerous grab handles and a ski-tow. Notably absent, however, were boarding ladders on the bow or stern. Given that the boat was accessible from both ends, they'd be worth adding. Two screw jacks hoisted the engine hatch, taking most of the rear bench with it. On each side of the engine, which was installed on offshore mounts and L-angles through-bolted to their stringers, there was more than ample space. Reaching the bilge, which was finished in gray gelcoat, for cleaning was easy. As a custom builder, Nordic will outfit the 26' Rush with as many interior amenities you and your wallet can handle. But for our Performance Trials the company sent a fairly basic, though far from poorly equipped, example. (That helped keep the price to less than $100,000.) The lack of goodies translated to more open space and less clutter than we've seen in a deck boat in recent memory, and there's something to be said for that. In addition to the console lockers, there were in-sole compartments and coolers, as well as stowage compartments under the bottom cushion of almost every seat in the boat. What that means, if passengers devote even minimal effort to stowing their gear, is that the nonskid sole of the boat should be free of toe-stubbers such as wakeboards, water-skis and coolers. 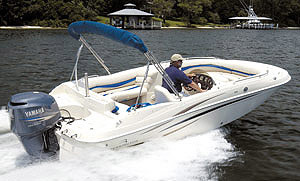 The manufacturer outfitted the 26' Rush's helm station with Gaffrig II instruments and a tilt steering wheel with the Nordic sea serpent logo in its hub. A throttle-and-shifter lever was installed on the starboard gunwale. Accessory switches were arranged in their own tier, below which was a Clarion CD stereo. Also at the helm was a Gaffrig by Livorsi mechanical indicator for the drive trim and electronic indicators for the trim tabs. Given the number of wakeboarders on the planet and the amount of passengers the 26' Rush can handle, it's a safe bet the boat will see wakeboard towing duty. Recreational riders will find the crests large enough to wish they had a higher connecting point for their tow ropes. Weekend water-ski warriors will be able to cut across the wakes, which tended to flatten and crumble at slalom speeds. Water-toy lovers will have a blast just getting tossed into the drink. Like our wakeboard- and ski-Test Team members, all will wish they had a boarding ladder. With catamaran-based offerings dominating the custom deck-boat market, it's easy to believe there's no other hull choice. Nordic's 26' Rush presents a spacious, comfortable and fun-to-drive alternative for buyers who prefer V-bottoms. Propeller Mercury Bravo One 15 1/4" x 26"
Upgrade to Mercury Racing HP500EFI engine ($20,700), WPM external steering ($2,910), Bennett trim tabs ($1,275), bimini top ($1,110), switchable exhaust ($1,075), compass ($380), depthfinder ($325), halon ($255) and drive shower ($195). Site location Colorado River Parker Ariz.
770 N. Lake Havasu Ave.